Sara Marchant received her Masters of Fine Arts in Creative Writing and Writing for the Performing Arts from the University of California, Riverside/ Palm Desert. 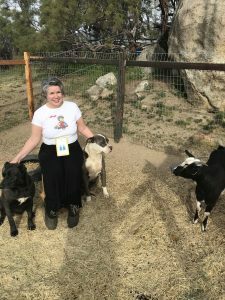 Her work has been published by Full Grown People, Brilliant Flash Fiction, The Coachella Review, East Jasmine Review, ROAR, and Desert Magazine. Her essay Proof of Blood was anthologized in All the Women in my Family Sing. Her novella ‘Let Me Go’ was anthologized by Running Wild Press. 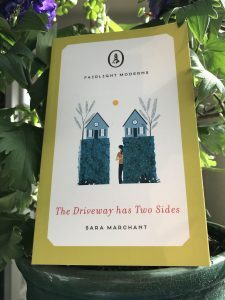 Her novella, The Driveway Has Two Sides, was published by Fairlight Books in July 2018. Sara’s work has been performed in The New Short Fiction Series in Los Angeles, California. Her memoir, Proof of Blood, will be published by Otis Books in their 2018/2019 season. 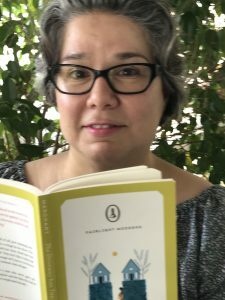 She is a founding editor of the literary magazine Writers Resist. Sara Marchant: The first book I fell in love with was Baby Island by Carol Ryrie Brink. It’s about two little girls whose ship to Australia sinks and they are put in a lifeboat with four babies and set adrift without adults accidentally. They wind up on a deserted island and hijinks ensue. I think I loved it because I loved babies and playing house. This was my first chapter book and it forced me to become a stronger reader because my entire family refused to read it aloud to me more than once. I stole my copy from the school library I loved it so much. It lives on the bookshelf next to my bed to this day. To unwind I drink green tea with honey because it is bitter, sweet, and astringent…just like me. Although I recently discovered beer with pineapple juice and I fear my life is about to be ruined. I believe James Baldwin’s The Fire Next Time should be read by every human being on the planet. Absolute required reading. My stepfather was forever asking me to read his favorite book, Horse and Buggy Doctor, and I never did and after he died I was too ashamed to read it and every time I see it on my mother’s bookshelves I hate myself. Anton felt light-headed. He took a few steps toward the safety of his car. The unpaved garage smelled like gasoline, mildew, and loneliness. She was waiting for his answer. My favorite book to film would have to be Game of Thrones because I never believed Martin’s female characters. Of course, the whole show should be about Arya, but hey. I’m very fond of The Last Bookstore in Los Angeles, but mostly I patronize the bookstores attached to libraries. Used books still have a lot of love to give. The one thing I wished I’d known about the writing life is that the friends I would make in my MFA program would become some of the most important people in my life. They are worth the enormous debt I’ll have until I die. No, writing doesn’t get any easier. But it is sort of like when Harry Potter is able to make that Patronus because he knows he can because he’s already done it in the future? This isn’t about validation, it’s about confidence in one’s abilities. Our canine children are Little Joe and Nena. The goat, Tessie Hutchinson, is the bane of our existence, but we can’t bring ourselves to eat her. The horses are Job and Ezekiel, but I mostly avoid them. My husband had a cat when he married me, but we are now and forever after cat-less. My last favorite traveling experience was when I had to get home from Cuernavaca, Mexico because my stepfather was ill and I traveled by myself to Acapulco and then home to San Diego and being alone, in unfamiliar space, was exhilarating. But usually I just want to be left alone to read on vacation. My favorite book cover is The Driveway Has Two Sides. I mean, look at it! It’s perfect! Gun Street Girl by Tom Waits deserves a movie of its own. My only Lit Festival anecdote isn’t very literary. I was trying to reach the bathroom and got entangled with the line for the John Green signing. There must have been hundreds of pre-teen John Green fans and when they thought I was trying to CUT IN LINE, they all wanted my blood. I started screaming, “Bathroom! Bathroom! I’m just looking for the bathroom!” and they let me live. Recommend a Small Press and Literary Journal? I have two favorite small presses: Fairlight Books and Running Wild Press. Soon, I shall have another: Otis Books. My favorite literary magazine is Writers Resist, for obvious reasons! My last impulse buy of a book was a large print sci-fi novel written by Walter Mosley that I bought for my mother although she hates sci-fi and now she’s angry at me because she loved Walter Mosley and now she’s disappointed in him for writing sci-fi. Sigh.